Apple convinced investors that life beyond the iPhone won’t be so bad, sparking a relief rally in the stock. The Cupertino, California-based company reported its first holiday-quarter sales decline since 2001 as revenue from the iconic handset tumbled 15%. But Chief Executive Officer Tim Cook and Chief Financial Officer Luca Maestri focused on a growing services business and rising sales of other devices. Mac revenue grew 9%, while iPad sales climbed 17%. The company’s Wearables business, which includes the Apple Watch and AirPods, surged 50%. Analysts viewed the results as “better than many had feared,” according to PiperJaffray’s Michael Olson. 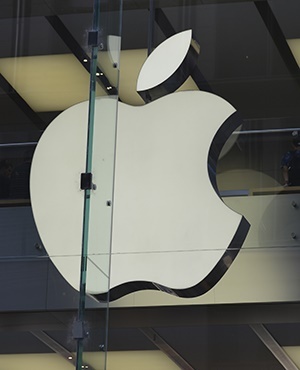 Market sentiment in the past few weeks had “become overly negative, ignoring the strength of Apple’s platform,” said Katy Huberty, an analyst at Morgan Stanley, especially non-iPhone revenue growth. On services, the Apple executives pointed to increased usage of Apple Pay and Apple Music. They also made a new prediction: The number of subscriptions will top half a billion by 2020, up from 360 million now. Without getting into detail, Cook suggested Apple will get further into the original video content business. Apple shares rose 4.8% in early trading Wednesday. The company had lost about a third of its market value since October as investors adjusted to the reality of a saturated smartphone market and the end of growth for Apple’s most-important product. Apple executives confirmed that customers are taking longer to upgrade their handsets, but said older iPhones will support the services business, while sales of other devices boost revenue. Cook noted the installed base of active Apple devices hit a record 1.4 billion in the fiscal first quarter. That’s the gateway through which customers access existing and future services from the company. The recent slump in Apple shares may already reflect falling iPhone sales, leaving investors willing to buy into the company’s vision for services. Still, the company will ultimately need iPhone sales to rebound or a major new hardware product. If fewer people use Apple devices, they will be less likely to pay for the company’s services. Apple has been working on an augmented reality headset, which it plans to have ready as early as next year. It’s also been adding health-tracking capabilities and iPhone features to the Watch. And while the services numbers impressed some investors, growth has slowed. The company blamed that on an accounting change, foreign exchange headwinds, approval delays for games in the Chinese App Store, and "some level" of deceleration for the AppleCare warranty business.